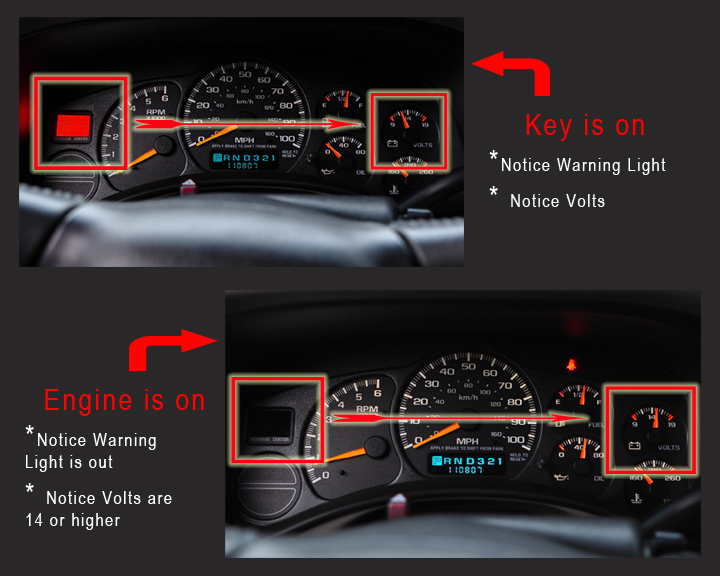 Being in the auto electric business for 30 plus years, I have a lot of customers who get confused when it comes to the engine indicators on the dash of their cars and trucks. When I say confused, I mean this, “Many vehicles have a little picture of a battery that must light up when the key is on and go out when you start the engine”. If it doesn’t go out and remains on after starting the vehicle, you have a Charging System Problem, not a problem with the battery. That light has nothing to do with the battery. When they see that “Battery Light” they automatically assume they need a battery. If you have an owners manual check it, it will tell you what that little warning light really means, you have a charging system problem. The light is red for a reason, all things red mean STOP. That little red light (being an image of a battery) has caused many problems. Think about it for a moment. Now that you know that you have a charging system problem, if the light stays on when the engine is on, and knowing that the Charging System is meant to keep your Battery Charged, how many of us have done this? My Battery Indicator Light came on and stayed on in my vehicle, I guess I better have my battery tested. Guess what’s going to happen? Your Battery is going to test BAD. Do you know why? Exactly, your charging system isn’t working properly or the Battery would be fully charged. But this is what usually happens. In most cases we don’t know it’s not the Battery since it just tested BAD, so we buy a new one. You install it, and Dang It All, the light is still on and the problem still remains. Fact is, you can’t test a battery that is not Fully Charged. Your charging system keeps the Battery Charged and if it’s not working properly, it cannot keep your battery charged. You can check your charging system daily, if you get used to what to look for. Here’s a couple tips to help you have more knowledge as to whether your charging system is working properly. Along with with the battery light, many vehicles also have a volt meter on the dash . When you turn the key on you should have a battery light and the volt meter should read 12 volts. Start the engine and watch to make sure the battery light goes off and the volt meter should go up to 14-14.5 volts. Congratulations, you have just checked your charging system. If your vehicle doesn’t have a volt meter, we have the solution. It’s a Battery Monitor that will plug into any power port in your vehicle and has an easy to read digital display. I’m not sure why our Automotive Industry decided that little red battery light should be our universal symbol for our Charging System in our vehicles, but it has caused more confusion and misdiagnosed problems then I can count. 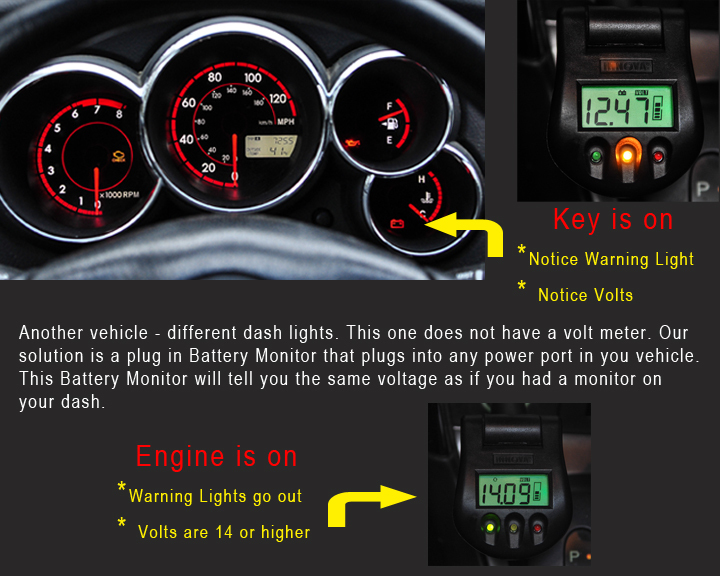 Many customers don’t understand that the battery light (charging system warning light) serves two functions. First function is, the light must be on when the key is on, and if it’s not, you have a problem with the charging system. The second function is, the light must go out when the engine is started, and if it does not, you have a problem with the charging system. Getting it checked by a qualified technician will save you from being stranded. Remember,vehicles have computers and will not allow the engine to run without seeing the proper voltage. CAUTION: If your vehicle quits because of a charging system issue, DO NOT attempt to jump start it, the battery must be charged, the engine will quit because the computer can not function without the proper voltage.